Zenghu Chang, in the Florida Atto Science and Technology Lab at UCF. He is wearing goggles to protect his eyes from the laser light. Photo by Susan Frith. Briefly returning to the A’s at the Curiosity Dispensary … Before I enter Zenghu Chang’s lab at the University of Central Florida, he hands me a pair of blue booties and tells me to put on some safety goggles. The booties help keep out the dust. The goggles will protect my eyes from intense laser light. Inside the Florida Atto Science and Technology Lab, a research team led by Chang has used a new optical technique to generate the shortest laser pulse on record—just 67 attoseconds (or 67 quintillionths of a second) in duration. Their results appear in the journal Optics Letters. Chang’s accomplishment brings scientists a step closer to the goal of being able to observe chemical reactions as they unfold. 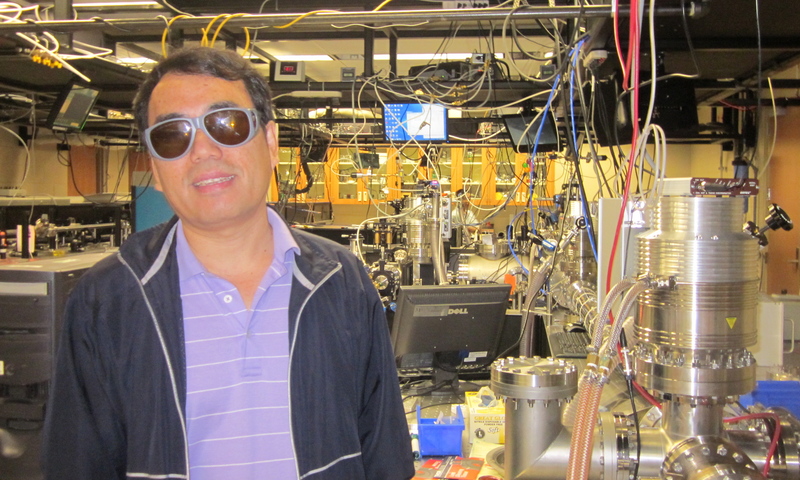 Dr. Chang, a professor of optics and physics, works in a whole different world—the world of the attosecond. In the time it takes you to blink your eye, he explains, 1015 attoseconds have passed. Comparing an attosecond to a second is like comparing one second to twice (actually 2.3 times) the age of the universe. If it were possible to take a tour through the shrinking units of time, your brief itinerary would go like this: seconds, microseconds, picoseconds, nanoseconds, femtoseconds, and attoseconds. Scientists have only been able to observe attoseconds for about a decade. The previous record of an 80-attosecond laser pulse was reported in 2008 by the Max Planck Institute in Germany. It begins with a femtosecond laser that emits a short burst of high power infrared light. Through a technique known as Double Optical Gating (DOG), that beam is “cut off” and changed into extreme ultraviolet light, producing a much shorter (67-attosecond) pulse. Next, the camera, called Phase Retrieval by Omega Oscillation Filtering (PROOF), measures the pulse by converting the light into electrons. A small portion of the same infrared laser that driving the attosecond pulse generation is used to kick the electrons. The “kicking” force is different for different slice of the attosecond pulse, which serves as the “shutter” of the camera. By measuring the speed change of electrons as a results of kick, the attosecond pulse shape is determined. Attosecond technology allows scientists to better understand how things work on a “very fundamental level,” Chang explains. “Our first goal is to actually see a chemical reaction as it happens. If we know this, we can control chemical reactions in the future.” At UCF and other institutions, researchers are working to create a device to actually start looking at this process. “It’s in the very early stages,” Chang says. Next stop, zeptosecond? I think I need a moment (or at least a few attoseconds) to catch my breath. This entry was posted in Attoseconds, Physics and tagged attoseconds, laser pulse, optics, physics, research, science, University of Central Florida by Susan Frith. Bookmark the permalink. And then there’s yer actual Plank Time, right at the supposed bottom of the pit of durations, nearly 400 million million million million times briefer than the attosecond. But that is only a theoretical construct – supposedly the time needed by light to traverse the Plank Length, the shortest possible distance that could (also supposedly) even exist. At least this chap and his chums has actually perceived something real. Is the ‘very fundamental level’ mentioned a quantum one, or s the attosecond still too ‘long’ for QM to kick in? That’s Planck of course. Derp.